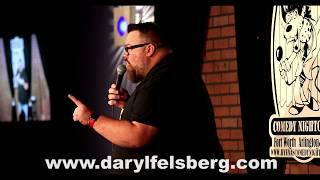 Likeable, laughable, and liable is what Daryl Felsberg is. After being on the road for over 10 years now, he has honed his comedyvoice into a character that the industry and fans alike are taking notice of. In 2009 Daryl produced his album “BadFattitude” selling nationwide, while getting air play on XM / SirusComedy.That sameyear Darylwas tappedto be the host of “TheShopper’sClub”; a shop from home show on aregional cable network. Darylwasyanked off the air after only 3 months for mocking th view more..
Likeable, laughable, and liable is what Daryl Felsberg is. After being on the road for over 10 years now, he has honed his comedyvoice into a character that the industry and fans alike are taking notice of. In 2009 Daryl produced his album “BadFattitude” selling nationwide, while getting air play on XM / SirusComedy.That sameyear Darylwas tappedto be the host of “TheShopper’sClub”; a shop from home show on aregional cable network. Darylwasyanked off the air after only 3 months for mocking the clients and their products, all though viewershipwasat an all time high. Daryl is recognizable from many commercials, and voice overs that he has done. Hisrants on obesity and society, and the absurdities of everyday life, keep audiences laughing and on guard. From stageto TV, the only thing bigger than he is,... are the laughs."